Logic is set to return with new music very soon. The talented rapper took to his social media channels to announce that the title of his next album is Everybody and it hits stores May 5. Logic made the announcement with a clever video trailer which reveals the album artwork painted by Sam Spratt (posted above). The trailer shows a young lady speaking an Indian accent and showing the ancient artwork to a group of children in a museum/exhibition. It also featured a new heard before instrumental as the soundtrack. 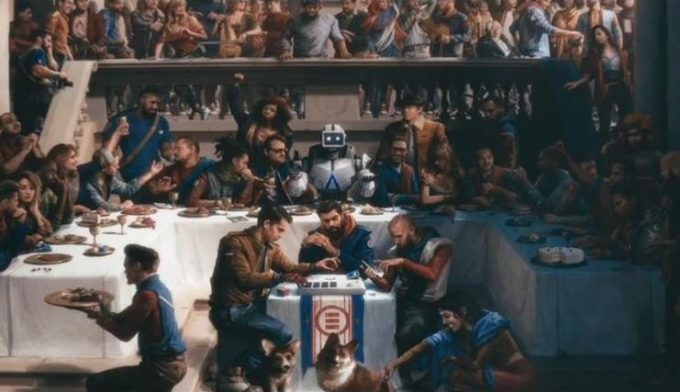 Everybody will be Logic’s third studio album, the follow up to 2015’s The Incredible True Story. Last July, Logic released a retail mixtape titled Bobby Tarantino. Watch the full trailer below. Pre orders for Everybody are set to launch at all digital partners on Friday, March 31st. The deluxe version of the album will include an in-depth documentary following Logic through the recording of the album, giving fans unprecedented access to his life and creative process. UPDATE: Freddie Gibbs has called out Logic for “jacking” his artwork and video trailer of his upcoming comeback album You Only Live 2Wice.